"The Virginia native’s list of accomplishments since then shows no sign of disability: He was a bronze medalist in rowing in the 2012 Paralympics and rode his bicycle more than 5,000 miles across the country in 2013. Now, he’s in the midst of running a marathon every day for 31 days, each in a different city. Wednesday found him in Albuquerque, where he completed his 21st marathon, putting him at somewhere around 550 miles since Oct. 12." “I have some soreness that you would expect, but it all kind of usually resets when I wake up in the morning," he said. Jones has family in the Duke City, making it was the perfect stop between Phoenix and San Antonio. "I just figured it would be a good city that would be receptive to my mission," he said. That mission, in addition to raising awareness about veterans’ experiences, is to raise money for three charities that have helped him and other veterans – the Stephen Siller Tunnel2Towers Foundation, Semper Fi Fund and the Coalition to Salute America’s Heroes." “Sometimes people think that a wounded veteran is a broken veteran, and I’m trying to dispel that myth by my own example,” Jones said. 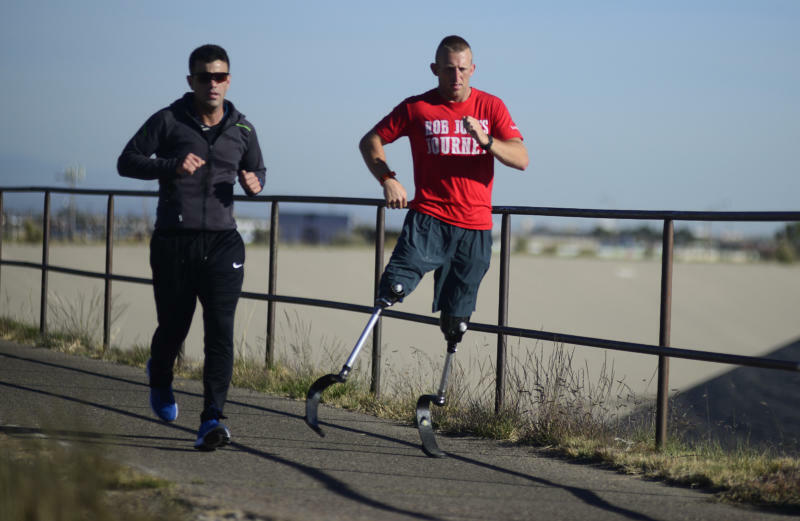 Jones started with a marathon on Oct. 12 in London, and wraps up Nov. 11 in Washington, D.C. His journey is dedicated to raising funds for military charities."